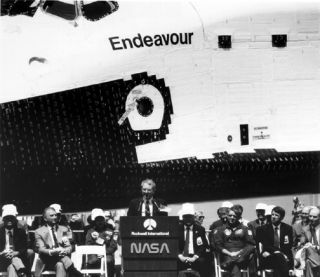 A NASA administrator addresses the audience at the rollout of the Endeavour. In this historical photo from the U.S. space agency, NASA Administrator Richard H. Truly addresses the audience in attendance at the rollout ceremonies of the Space Shuttle Orbiter Endeavour which occured on Apr. 25, 1991, at the Rockwell International facility, Palmdale, Calif. Endeavour, the fourth Orbiter to join the fleet, replacing the lost Challenger, can be seen in the background.